A home exercise program is a set of therapeutic workout routines that are performed inside a person’s home. These workout routines can be performed without the presence of a medical professional. 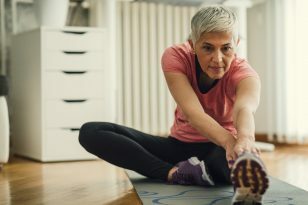 Typically, the individual will be taught the exercise routine by their physical therapist first, and then perform the routine at home to increase the chances of it being successful. Home exercise programs, if performed correctly and frequently, have the ability to treat pain in the lower back, shoulders, neck, ankles, hips, and a variety of other targeted areas. How are Home Exercise Programs Performed? There are some general rules that can be applied when performing home regimens, however, your physical therapist will most likely give you a specific approach and you should follow their specific instructions. What you should wear for home rehab – You should wear appropriate exercise clothing, preferably non-restrictive, so that you have free range of motion. Also, it is important to make sure you are executing the exercises in an area that is safe and conducive to performing the type of movements you will be doing. How to properly warm-up before exercising – It is always important to perform a general warm-up before beginning your rehab exercise. This warm-up can be done by simply doing 10 to 15 minutes of brisk walking or another similar activity which you find comfortable. You should never perform any activity that increases your pain. How much & how often should I do this – When starting your strengthening exercise, it is usually recommended to start with 1 set of 8-10 repetitions, and using either no resistance or light resistance. Gradually, you can increase your exercise to 2-3 sets of 15-20 repetitions. These exercises will be most effective if they are performed on a regular basis. If you can, try to do the entire program once per day.